For the young and sections of the Indian middle class he is a “hero” who has “unmasked” corrupt politicians. But there are many who can’t stand the Magsaysay award-winning activist-turned-politician’s “methods” that have further vitiated the country’s political discourse. Now Activist-turned-politician Arvind Kejriwal has said that his political party will be founded on 24 Nov 2012 and added that the national council meeting will also be held on the same day. The fact that his one-time mentor, Anna Hazare, has kept silent about Kejriwal’s attempt to catch people’s fancy and to garner future votes, speaks volumes, say his detractors. 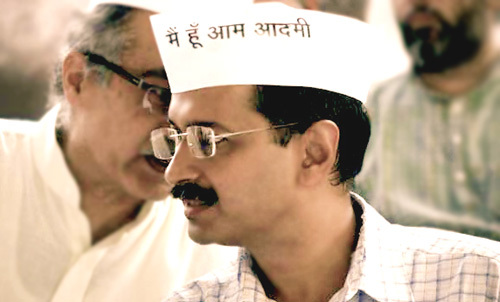 He parted ways with Hazare, who has now announced a new anti-graft team – minus Kejriwal. While Kejriwal still wears the Gandhi cap, that was once again made popular by Hazare, it now has the words “Main aam admi hoon (I am the common man)” on it. It earlier had the message – “I am Anna Hazare”. Since the Oct 2 announcement about forming a political party, his organisation, called India Against Corruption (IAC), has made a splash in the political arena by leveling charges against Congress president Sonia Gandhi’s son-in-law Robert Vadra and Law Minister Salman Khurshid of illegal land deals and fund embezzlement. But like a canny politician, he knows if he has to make a mark of “being different” he has to target parties left, right and center. But the 24X7 media coverage of Kejriwal has ensured that he has become a household name. This time he has been able to capture the imagination of youth, which he could not achieve when he was under the shadow of social activist Anna Hazare. He has also struck an instant chord with the middle class, when he accused both the Congress and the BJP of being hand in glove and also took up the burning issue of high power tariffs in the capital. He has clearly mesmerized youth and the middle class who want a change in society, a society that will be free of corruption in high places. It’s no wonder that IIT and IIM graduates are joining his organisation. “He is very convincing. A lot of IIT/IIM students and professionals come voluntarily to help us,” Kumar Vishwas, an associate of Kejriwal, told IANS. Lets hope for the miracle which may revolutionary changes the thought and process in World’s Golden Bird Our Country ” Mera Bharat Mahan ” INDIA.